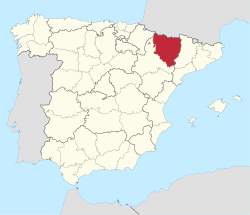 Huesca (Aragonese: Uesca, Catalan: Osca), officially Huesca/Uesca, is a province o northeastren Spain, in northren Aragon. The caipital is Huesca. Positioned juist sooth o the central Pyrenees, Huesca borders Fraunce an the French Depairtments o Pyrénées-Atlantiques an Hautes-Pyrénées. Athin Spain, Huesca's neebourin provinces are Navarre, Zaragoza an Lleida. Wikimedia Commons haes media relatit tae Province of Huesca.